How very exciting, we are turning TWO! After the video read on for the latest updates. New French editor Christophe Michel adds the James Alcock page to French Wikipedia, Christophe will also be interviewed as our French representative for Observatoire Zététique. The OZ has agreed to support us with updates as the French team rolls them out. The Portuguese Team scored our very first non-English DYK on the front page of Portuguese Wikipedia. Unlike the English page which stays up only 8 hours, the Portuguese DYK remains for days. So for a week or more in May 2013 Portuguese readers were treated to a photograph and DYK of our very own Neil deGrasse Tyson which they had translated in March. Looking over the stats from that period you can see that the Tyson page was averaging about 100 views each day. There are spikes of over 1,000 each day during the time he was featured as a DYK. But as you can see, the views every day since the DYK are averaging about 300 views. I'm not sure what the reason is, we released this page in March and it could be from a combination of things. All we know is that his page views are over 3x's what it was receiving before our involvement. A win for science! Even more interesting. Look at the stats for Carl Sagan's Portuguese page for the same time period. Averaging under 100 views each day, now it is averaging 500 a day since our involvement. The same effect is happening (though smaller) on the Cosmos page. CFI was kind enough to send me to lecture to the Portland CFI group in May, there I found 3 new editors. One of which has just finished a re-write of the Rationalism page. View the before page. Now the after. Great work Joshua Filmer! Leo Igwe was just given the high honor of receiving 3 new pages in one week. German, Dutch and Russian. English editor Bill Grieb re-wrote the page for Phil Plait's Bad Astronomy book. Yes, even books can have their own Wikipedia page if they are noteworthy enough. This is such a well written page, that others on our team will be using it as an example for other book pages they are currently working on. So stay tuned. As you know, we try to get our pages noticed outside the skeptical community. 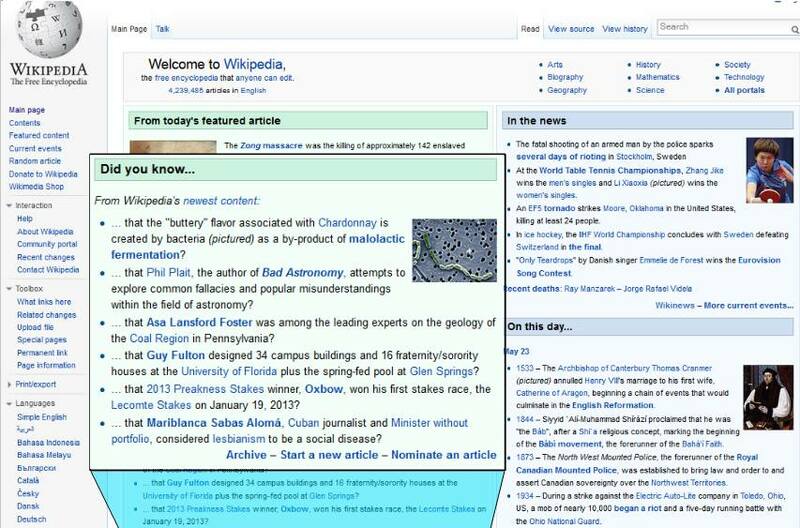 So Bill managed to get the Bad Astronomy page on the front page of Wikipedia for 8 hours as a DYK. Here are the stats during that period. When I knew that the DYK was going to appear, I wrote to Phil Plait to tell him. To my surprise he wrote a blog about it for Slate Magazine. That article gave us several new editors. Thanks Phil! Here are the stats for the Plait WP page. English and Dutch editor Wim Vandernberghe has translated the English ADE 651 page into Dutch. Maybe some governments will benefit from a good Google search before they invest in their next "bomb" detector. Josh Hunt (from Cleveland, OHIO Skeptics) took issue with the Gore Orphanage Wikipedia page. As you look at the before page you will see how it was depicted as if this orphanage was really haunted. Many Ohio ghost-hunting groups venture out to the ruins of this orphanage to report back on all the "activity" they find. Funny that, as Josh discovered that there was no such place called Gore Orphanage, only a Gore Orphanage road. And even more odd, there was no Orphanage. At least not one that had been burned down killing children. Seems that this is all a urban legend once you look into the story, wonder how the ghost hunting groups explain this? This page has been a long-awaited re-write. As I've said before, I do not assign projects. People choose something off the list or come up with something on their own. Shane Vaughn for whatever reason selected Phillip Klass for a re-write, and I'm very pleased to show you the Before and now the After. I've had a few interviews since the last update. Skepticality Podcast continues to allow me a few minutes each episode, and editors roll in after each one airs. All of them long-time listeners to Skepticality, I'm told they have been wanting to get involved in a project that can be done from home that makes a real difference in the world. They all tell me they have found it with GSoW. Thank you Derek Colanduno for your support. CFI and the JREF have been very supportive of this project, with publicity, retweets, and opportunities to lecture. Thank you for supporting us. There are many other people to thank, including my vast group of Facebook friends who step up when I need something Photoshoped or advice about some bit of research. The comments, retweets and shares really help our team succeed. If you look at our last update you will see that I have had many interviews and shout-outs the last few months. Everyone has been so nice and supportive even though I tend to ramble. Skeptical Connections Podcast is just starting out and allowing me a segment to talk about on-line activism as often as I want. So that is it for this update. There are many more projects that are in varying stages of completeness. We don't just churn these pages out, it can take weeks of research to re-write (or create) a page. Add in the formatting and code associated with writing for Wikipedia, and you will see this is a very difficult chore we are taking on. I don't want to scare away potential editors, we do train. Everything is discussed throughout the process, positive feedback is given and nothing is released onto Wikipedia unless it has been reviewed by several editors. I promise we won't allow you to blow up Wikipedia. I should mention that not every person on the team is involved in research. We have people who support pages by copy-editing and photography. Some people caption videos. Some are involved in small edits that only take a few minutes to finish. There is a lot of work to be done. We are in this together, so please consider joining our team. Friend me on Facebook and I'll get you started. Lets Go! Yay! Such amazing work everyone! You all might want to take a mosy over to the Mokele-Mebembe page on Wikipedia. I've added links to Prothero's comments on the 2009 Monster Quest programs, but more needs to be done to link the later expeditions including the 2012 Newmac fiasco to creationism. Hi Susan, I'm italian, how can I help you? Teppic - please friend me on FB so that we can discuss how best you can help. I'm shocked that we have not yet a single Italian editor.